The actual ‘process’ of getting divorced is in fact, quite simple. It is the legal wrangling regarding things like one partner not wanting a divorce, dividing assets, who gets the children etc. which often make divorces drag on for months and sometimes years. A divorce is put into process by completing a form called a ‘petition for divorce’. Although you can obtain one of these from a solicitor, you can actually pick one up in some local stationery shops or from the HM Courts website. You do not have to employ the services of a solicitor to get divorced but where there are children involved and/or financial issues to consider, it is wise to do so. You must have been married for at least a year to start a petition and the form asks you to explain the reasons for wanting a divorce. Basically, there are 5 broad categories, any one or more of which you need to fulfil before the court will consider your case. You must satisfy the court that there has been a case of adultery by your partner or that they have displayed unreasonable behaviour. 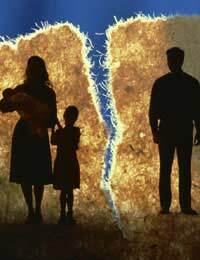 Whilst these are the two most commonly cited reasons for a divorce, other grounds on which the court will consider are where you have been deserted by your spouse for at least 2 years, have been separated for 2 years or more, if you both agree to the divorce or have been separated 5 years where either party does not agree to the divorce. Once you have completed the form, you then take it to a divorce county court. Once the court receives your form, you have then set the divorce process in motion. They will consider your reasons for wanting a divorce and you must satisfy the court that you have sufficient grounds for wanting your marriage to end based upon the valid accepted reasons as outlined above. These reasons must satisfy the judge that the marriage is, indeed, over - the legal term being that the marriage has ‘irretrievably broken down’. If the court agrees, then from here on in, you will be legally known as ‘the petitioner’ and the partner you’re divorcing becomes ‘the respondent’. You must also include copies of your marriage certificate and any information regarding any children who are involved as a consequence of the divorce petition. If you are petitioning for divorce on the grounds that your partner has committed adultery, you can also give the court the name and address of the person you’re claiming they have committed adultery with. If so, they then become known as ‘the co-respondent’. The court then carries out the process of ‘serving the petition’. This is where they send out a copy of the petition to your partner and, in the case of adultery, they also send out a copy to the person with whom you are claiming your partner committed adultery with. Your partner then has 8 days to acknowledge receipt of the petition. If they fail to do this, the court will contact you again and ask you if you can supply any further details and, if necessary, they will arrange for a court official to serve the petition again, this time in person. This is the part of the process which complicates and lengthens the whole process of the divorce procedure. It begins by determining whether or not your partner agrees to the divorce or wishes to contest it. If they fail to agree, the court may ask you for further information and you should also employ the services of a solicitor now, if you haven’t done so already. If you have children, the court must look at all the facts and come to an agreement about who the children are going to live with and where and also establish the contact rights for the partner who won’t be living with the children on a day to day basis. Probably the most important part of the whole process, the decree nisi is where a judge has reviewed all of the information available to them, has checked that all arrangements for the children and all of the financial issues have been resolved or are in the process of being resolved and, if everything is in order and is satisfactory to the judge, then a decree nisi will be granted. At this stage, however, you are still legally married. This is the final stage of the process and usually occurs around 6 weeks after the decree nisi has been granted but you have to apply for it yourself. If you don’t, then your partner can apply for it themselves but only after a further 3 months have passed. During the initial 6 weeks between the decree nisi and the decree absolute, the judge will be ensuring that all arrangements regarding any children are in place and that the finances have been settled and if those are both in order, then upon application, the decree absolute will then be granted. At this stage, you are no longer married and free to re-marry. Although one or both partners may be asked to attend court proceedings, this is not always the case and, if everything appears reasonably straightforward, the entire process can often be administered from start to finish by post. Been separated from my partner for nearly 8years and have a county court order in place for money for the kids. How do I get a quick divorce?